If you can make Brazilian series A and B with 20 clubs that would be great. I can tell you the clubs to swich. The Brazilian calendar is just far too cramped to make these changes (although you're reducing the number of teams, you're increasing the number of fixtures from 24 to 38 for both divisions. I know IRL the Brazilian leagues run from April to December rather than CM's August to December, but extending the leagues like this for CM would mean rearranging dozens (probably 100+) of the state league fixtures too. The trouble with those clubs is that none of them are hard-coded in the game so it's difficult to do anything with them. I think zozoa had some way of overcoming this when he used to assign point deductions to certain clubs, but I didn't understand the process when I last looked at it. If the offset can be found I'd really like the managers retiring at 70-75 rather than 65 (and often earlier) to reflect real life. Other minor issue: reputations of managers drop after a few years and only 5-10 managers are above reputation 'Average' in every country instead of the 15-20 at the beginning of the game. A side effect from that is that the managers who own promotion in the second tier are immediately in the top 5 of their country. The reputation boost of achieving promotion is in general too big I think. Look at the coaches IRL who achieved promotion to the top tier in the big leagues, it's not like one of them is going to get a job at a big club in the near future (except of Espirito Santo, but that's because he is also achieving good things this year), most of them are already sacked . I remember that in CM 00-01 the increasing and decreasing of reputations was excellent, you got a boost when you overachieved with your team and vice versa. And managers got sacked more often. No manager of a top club survives a 6th or 7th place finish IRL, while in the game it's no problem and the same manager stays for too long. Bug is also still there (like in the original game I think) where international managers get signed by very low rated teams as a coach, and when they get sacked they never turn into 'manager' again (especially frustrating because it are often the big names like Low or Luis Enrique). But really, these are minor issues, the patches are really fantastic, great to hear a +v7 is coming up! Lots of good suggestions. Extending managers' retirement ages and preventing international managers from becoming club coaches are towards the top of the ever growing to-do list. I agree that chairmen should be a lot more demanding in the game too - clubs are a lot less patient today than they were in 2002. Only Holland and Portugal look low here, and a lot of the time the succesful managers here get poached by clubs in bigger leagues. Though this is only one save game. I have not played the patched version for a while. Come on. You request all these things and don't even check whether they're already in the latest patch? Saturn, is there anyway you can address this regens not increasing in Physical attributes and avoiding the goal draught of the ODB regens? The lowering of positioning of regens is already active (assuming he's kept Tapani's code) so goals drying up isn't an issue. Physical attributes not increasing is a problem with current players on recent patches, not just regens. I saw a bit of talk about this in Nick's patcher thread. When did people first start noticing this - Tapani 2.21.1? I mentioned tweaking some of Tapani's regen code here, which can sometimes result in physically impressive regens like this. This guy is not at all representative of what most regens look like, just to show that tweaking some of the regen code can produce physical freaks like this. I know this is an issue with current players too so the fix being in the regen code might sound unlikely. But tbh I've no idea the scope of Tapani's new regen code, perhaps there was some adverse effect on training physical stats in amongst it. As I wrote: please remove the ban on the purchase of more than 10 foreigners in Russia and in this life I have nothing more to wish for Do not confuse the number of foreigners in the squad of the match and the purchase of players! The first I can change myself with Flex. In reality, in Russia now there is one restriction: a maximum of 6 foreigners in the squad of the match , there is no ban on the buying, you can buy 20 foreign players. 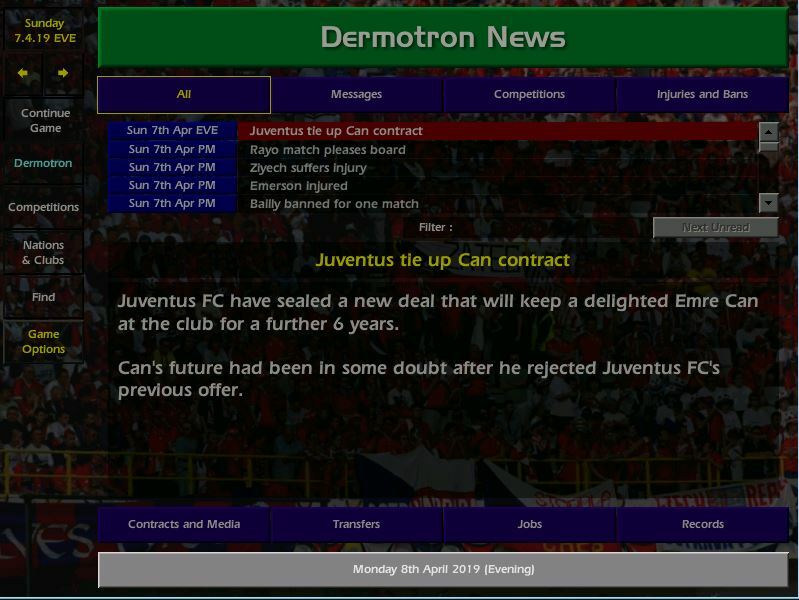 I seem to remeber adding this because the Russian AI clubs went crazy signing foreign players without it. When you say you can buy 20 foreign players, do you mean the limit is 20? Or are you just saying that you can buy as many foreign players as you like? Is there a possibility that loans in Argentina are only in the transfer window? And that they can only last 6 months, 12 months or 18 months? There are no loans in Argentina for only 1 month and outside of that period. Forgive the audacity. Could the start and end dates of the Copa Argentina and the Copa Libertadores be modified? I apologize if this message does not correspond to this topic. With respect to the Copa Sudamericana, the fixture is similar. February to November and the final is a unique match. Round of 16, round-trip matches, until the final that would be a unique match. Player that has been registered for COPA LIBERTADORES will not be able to play in COPA SUDAMERICANA, identical if it were to the revez. The loans outside transfer windows is annoying alright, there's a few leagues that suffer from this. It should be fixable but might take a bit of experimenting with. Cup fixture changes should be doable, though knock-on effects to the Argentinian and Brazilian leagues would have to be checked first. Player registrations would be close to impossible to implement though. Creating new Super Cup competitions should be possible as they're are a few other Super Cups disabled and thus unused in the exe, though it's still something I'm not really familiar with. Generally for the next patch I'm just looking to just add things that I can literally do today. A few requests would take longer than that. I'm hopeful though with v7 that I can release new versions of it along the way, so if something is found in two weeks time in the Offsets thread for example, there'll be a v7.01 and you won't have until October and v8 for it to be implemented. So although it might seem I'm fobbing off a few suggestions here, they are all being noted. I think you need to take that up with the Update Team mate since they are the ones doing the data. Saturn is not possible to enter relegation in the Korean league? I'm saying the actual limit is 10 players. For example, if I use Flex to set 15 foreign players in match squad I still can't buy more than 10. 6 foreign players on the field. There are no limits for buying. Ok about brazilian league . In 2020 will start to have a brazilian super cup, maybe you can add that? will be a single game in 22/01/2020. Also, can you remove the cd message at the start of the game? I wonder if it is possible for you to put a patch change so that the maximum duration of a contract is 5 years. I think it would be closer to reality, because in the game you can place a contract for up to 10 years. We are talking about a game that is imperfect. All this past realism like "Bosman's Rule", etc. only prevents play. - reduce number of fixtures (as IRL). To achieve that, some leagues may need reduce number of teams (as IRL) and some other may need change from 2 league rounds to 1 league round (as IRL). If thats hard or time consuming, this step can be skipped. - Move the start from beginnig of august to beginning of may (as IRL). - Change from 28 to 20 teams (as IRL). - Change league from single round (27 games+4 play off games) to double round (38 games). - Remove play-offs. I think i heard its hard to remove play-offs so this step can be skipped. - In real life the best teams plays in Libertadores and the second bests play in sudamericana (exactly as Champions league vs europa league). Currently in the original game the same teams who play in libertadores also play in sudamericana and this is not as real life, its like if barcelona played in champions and europe league in the same season. No, I don't know how Tapani added this for other leagues. Change the value bolded above to whatever you want: 32 would mean no restrictions. I think competitions that don't even exist yet will have to join the back of the queue! The CD message was removed a while ago by Tapani. As GFRay says this is a data issue. As others have suggested, I'm not 100% sure there is a five year limit IRL. Either way I don't think the AI ever hands out long contracts in the game, so if it's only exploited by human managers then just resist the urge to do it! The state leagues' fixtures being reduced (and not overlapping with Serie A & B) makes restructuring Brazil a bit more feasible, but it would still be a considerable task. Disabling the play-offs is not possible at the moment, but might be in the future. In real life the best teams plays in Libertadores and the second bests play in sudamericana (exactly as Champions league vs europa league). Currently in the original game the same teams who play in libertadores also play in sudamericana and this is not as real life, its like if barcelona played in champions and europe league in the same season. I'm not too familiar with the code for cups' team selection. I've seen bits and pieces such as the 20 Sudamericana teams being selected at 004C6890, but I wouldn't know how to replace this with code that would pick the Brazilian teams that finished 7th-12th in Serie A for example. The patch is close to a release. Maybe FIFA announced a change in the transfer system in-game? I'm not sure what you're trying to say with that post? Are requests for new exes not being taken? It's not immediatly clear to me by reading the reply you linked.